Monday, February 20 is the U.S. Presidents Day holiday. Many U.S. Exchanges will be closed, but CSI will be open for business as usual. Investors come to CSI for many reasons. Some seek software and data to help them navigate a winning course in the futures, stock or options markets. Others use CSI data along with trading systems developed by third-party vendors so they can easily tap into tried-and-true analysis expertise. Whatever the initial motivation for engaging CSI’s services, the anticipated result is the same for all: success in trading the markets. Within the framework of CSI’s Unfair Advantage software and services are several unique features that are designed to help all of our subscribers (whether self-directed or guided by trading systems) maximize their prospects for success. Over the next couple of months I’ll discuss these tools, starting with 1) our website correlation studies, which allow you to see if market projections are consistent with related markets and 2) our Trading System Performance Evaluator (TSPE) software, which lets you verify that combined account holdings are moving in a direction that is consistent with projected and anticipated profits. Each of these tools is valuable in its own way, as described below. As discussed in the May 2004 CTJ (Seeking Wisdom In Intermarket Correlation Reports), it is more valuable to know the likely direction of multiple, related markets than to know the likely direction of a single market. CSI's correlation studies, found on our website at www.csidata.com, reveal the relationship between any two markets and show which markets bear the highest and lowest levels of historical correlation. High correlation values (approaching +1.0) indicate a tendency to move in tandem, and very low values (approaching -1.0) show a historical tendency to move in opposite directions. Every day the CSI host computer spends hours churning through data on every world futures market and stock, pairing and comparing each with every other world futures market and stock over the past 12, 20, 30 or 40 years (where possible). The result is a vast and invaluable database showing the mathematical relationship between markets (their correlation coefficient). Tables are fashioned from many thousands of market pairs each day that reflect the degree to which any given pair of markets possesses similar responses to common economic conditions. Reaction from worldwide trading interests indicates that the most ardent fans of this unique CSI offering seem to be in-the-know analysts. 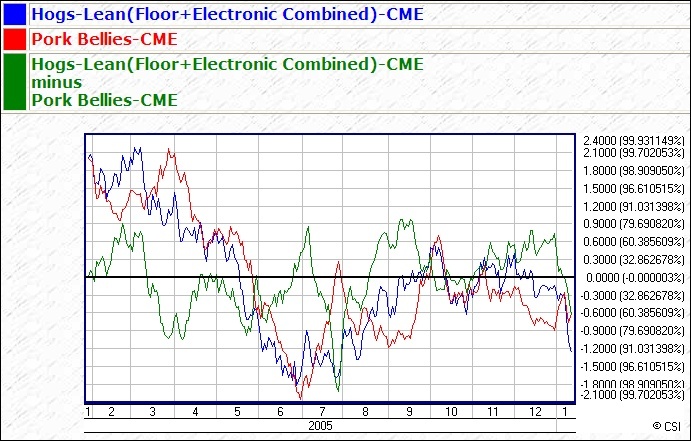 Traders derive information from our correlation database in either of two ways. You can either enter the symbols for any two markets to reveal the correlation data for the specific pair, or view the actual tables, two of which present the most and least correlated markets. When investigating individual pairs, the website will report the correlation coefficient for a range of time periods and graphically display an index of each market’s price activity, plus the spread between the two. This lets you see just how correlated two markets are at the present time and historically and to apply that knowledge to your trading decisions. You can use the graphic presentations in the correlation studies to verify that the market you propose to trade is moving in tandem with other markets that are heavily correlated over time. If the heavily correlated markets you discover on the website are moving up, your target market will likely move up. On the other hand, if you display a market that is negatively correlated with the market you plan to trade, your chosen market will likely move in the opposite direction. The significant analytical value lies in helping you assure that you are positioned in the market in the correct direction. If your trading signal suggests that you trade against the prevailing direction of correlated markets, you might want to reconsider the trade, or at the very least, be diligent in setting stop-loss orders. With the correlation studies, you will have a good idea whether your holdings are likely to turn a profit or a loss and can adjust accordingly. For example, let’s say you’re contemplating a long position in Lean Hogs futures (LH), which show a 75.8% correlation with Pork Bellies futures (PB). It would be supportive of your proposed LH position if PB prices were currently moving in the same direction as the LH market, so check the correlation graphic of the two series to find out. More revealing would be the rate of change over time of the Pork Bellies market. In such a scenario, if Pork Bellies were moving up at a rate of change faster than Lean Hogs, then your Lean Hogs position would likely be secure. The reverse would be true when approaching a selling decision. 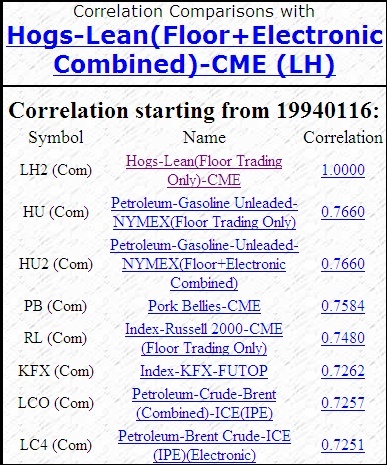 This graph from the Correlation portion of the CSI website was compiled from one year of daily pricing statistics on the Hogs-Lean (Floor+Electronic Combined) and the Pork Bellies converted to USD. This chart displays the two series and a graph of their difference. The two series are each scaled by subtracting the whole-chart mean and dividing by the whole-chart standard deviation to get their Z-scores, which are presented graphically. The difference of these Z-scores is also shown. The scale on the right includes both Z-score and the implied normal probability. The tables of most and least correlated markets are a great starting place for understanding market dynamics and in selecting markets to consider for trading. Both of these reports tell an important story about each market that you may choose to trade. If you haven’t visited the Correlation studies on our website in a while, you should be pleasantly surprised by recent changes. CSI programmers have made it easier to navigate and have included the ability to exclude information on the untradable economic indicator data from your results. Access to CSI’s correlation studies is free to Unfair Advantage subscribers who have paid the CSI licensing fee and CSI’s regular published rates (see website). Others may gain access to this service for a fee. I think you’ll agree that to be successful, the overall performance of your account should consistently move in a positive direction. Your success can be verified by tracking the trade-by-trade profit (loss) outcome of completed trades, either manually or through UA’s Position Manager. If you log these trades, plus information about the trading system itself into Unfair Advantages’ Trading System Performance Evaluator software, you will gain or quickly lose confidence that you are on track for realizing repeatable profits. You will also have a good idea of whether profits or bankruptcy are in your future. The best way to get started with TSPE’s system verification tool is to paper trade your proposed system until you have sufficient experience to make an informed judgment about necessary funding and your future probability of success. Many analysis programs, including Unfair Advantage in its “Interpreted Studies” module, can help you to get started with this by simulating profits and losses over time. Using techniques called "sampling with replacement" and "Monte Carlo Simulation," TSPE will randomize your representative sample of profits and losses and then simulate thousands of trading sessions at a range of funding levels based on the information you provided about your trading system. The analysis is complete when residual capital is insufficient to meet the exchange-imposed margin requirement or your stated goal is met. TSPE keeps track of the percentage of winning sessions for each funding level. The winning percentage for each capital level is presented as the probability of reaching the goal. As the Unfair Advantage manual will tell you, TSPE's objective is to find the probability that a proposed dollar goal can reasonably be achieved with a given capital stake, and to compute the expected level of goal satisfaction. Our intent is to help you uncover the more promising trading systems and to warn against committing funds to improperly conceived methods. Whether you came to CSI to chart your own course or through the guidance of an analyst you admire, the tips listed here and in next month’s CTJ can help you become a better trader. My measure of trading success is steady capital growth, coupled with goal attainment. Only you know what constitutes successful trading for you, but I hope these suggestions help you achieve it. Each month in this column the CSI Technical Support staff addresses topics of interest to many CSI subscribers. This month they discuss adding and manipulating studies through Unfair Advantage’s Study Toolbar and saving charts with UA. Q. I’m using the new drop-down “Indicator” menu to add studies to my Unfair Advantage (UA) charts because it’s a really quick and easy tool. However, I would prefer to view a few studies at once and to experiment with different parameters. How can I do these things with UA? An added bonus: You can edit the programming code and even write your own studies through the Study Toolbar’s Interpreted Study feature. Use the existing code, particularly the “written-out” versions that are available for some studies, as guides for form and syntax. Q. I’m confused. The menu of indicators available for inclusion in my Study Toolbar seems to change at will. Every time I click “Indicators from list” on the Code Editor screen, the resulting menu is different from the time before. What gives? A. You’re right, the menu of “Indicators from list” is not constant, but it doesn’t change arbitrarily. There are actually four similar, but distinct lists of studies that reflect the study libraries written in different programming languages. The language selection (from the File menu) determines which list you will view, depending upon whether your selected language is VisualBasic (VBScript), Perl Fast Mode, Java Script (Jscript) or our own AnyLanguage. Most of the lists offer eleven categories and dozens of standard studies, but the Java Script (Jscript) menu includes an extensive library of studies from Stocks & Commodities Traders Tips and the AnyLanguage menu includes a large collection of EZ (easy) studies that were added to accommodate customer requests. Q. Can I save an Unfair Advantage chart as a picture on my computer? If so, can I recall it later within UA? A. UA offers two ways to save charts, and each has a specific use. You can save a graphic image on your computer’s clipboard through the charting right-click menu. Just click your right (not left) mouse button and then select “Copy Image to Clipboard,” near the bottom of the menu. You can then paste that image into a document produced through your word processor or graphic editing software and save it. Your saved file would be suitable for printing, but not for use within Unfair Advantage. If you want to save and recall a chart within Unfair Advantage, use the “Save Chart” and “Open Saved Chart” features found on UA’s “Chart” menu. When you open a previously saved chart, you'll find that both the data and any included studies have been updated through the date of your last data retrieval session. Over the next 30 days we expect to release UA version 3.0, which will dramatically improve the speed of daily data collection and distribution. Our time trials show daily updates were five to ten times quicker, so collection time dropped by as much as 90%! We look forward to bringing you this vast improvement. Check our website for your free download. Access to CSI’s website correlation studies comes free with a regular subscription to the CSI Futures database, as described on our rate schedule. Users of various discounted services may view the correlation studies by either upgrading to a standard account (annual or month-by-month) or by paying a $20 monthly fee. An annual discounted rate of $200 is also available. Contact CSI Marketing to subscribe.